Last week we had a few days in the 40s and 50s. 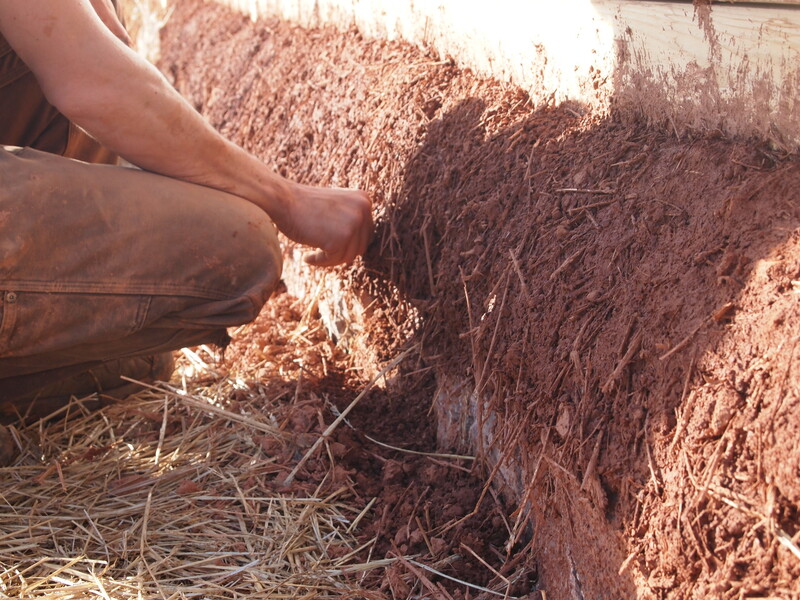 We took advantage of this and finished the short cob wall on the south side of the greenhouse. The snow-free days also allowed us to inspect the state of our cover crop trials and prep several rows with straw mulch. In checking on the state of things, we discovered that quack grass in the back field is already on a roll. Rats. 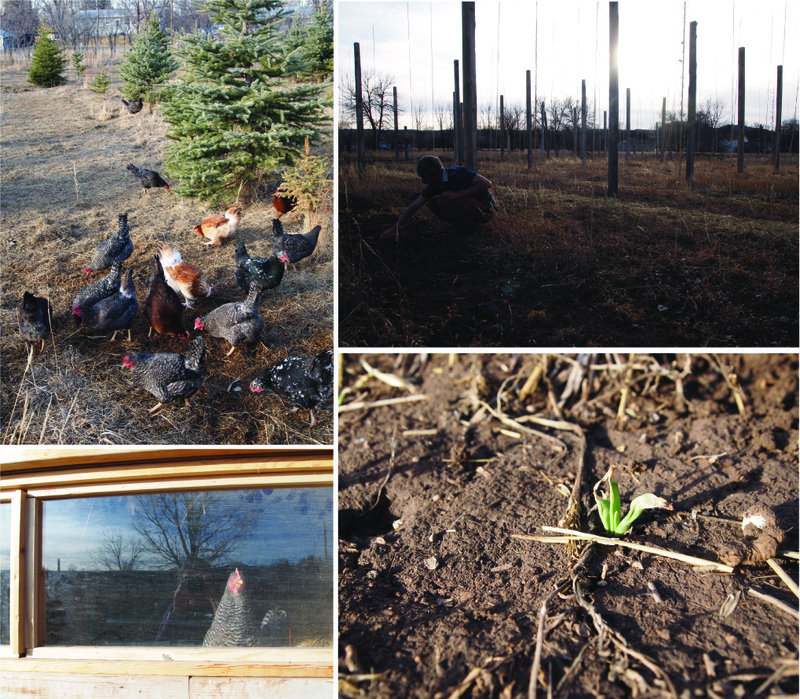 And early onions planted last fall have survived and are going strong (there’s a photo, below). Jeremy got to try his hand at cutting glass for the coop window. It’s an old pane from the Smith’s house. The glass itself might not be from the original construction of the house (late 1800’s) – but it’s still pretty brittle and took a fair amount of tender, delicate, James Bond-style breaking and entering finesse to cut without shattering to bits. The birds are enjoying the extra light in their coop. They are also enjoying spent grain (photo below..) from Crow Peak Brewery down the street. Despite all this attention: the additional light, their certified organic feed, malted barley, and our daily dotings, they are producing 4-5 eggs a week. It seems the birds have become a very expensive hobby – at least until the days lengthen and egg production picks up. Our seed orders were placed just a few weeks ago, and already we’ve been getting packages in the mail. Onions and leeks have sprouted. 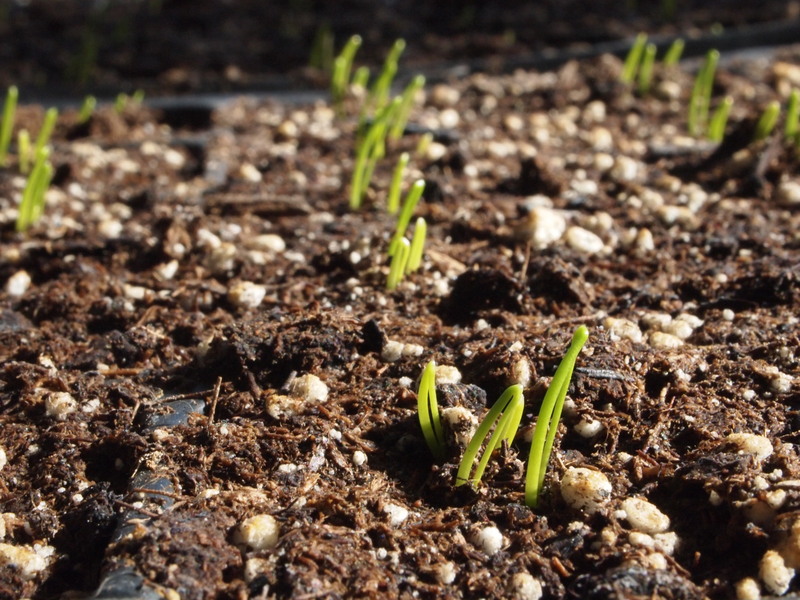 And trays of asparagus are germinating. Last year we experimented with planting green onion seeds in clusters of 7-8 seeds together. This method allowed for quick, easy transplanting into the field and harvesting, washing, bunching – chop chop. This year we’re going to try out this cluster seeding technique with bulbing onions as well, with 4-5 seeds together. We’ll see. We’ve been keeping an eye on the hives during the unseasonably warm days these past few weeks. There has been limited activity outside the hives, a bee or two will fly out, sometimes one will scoot in. Lots of dead bees below the entrances to the hives. This is not terribly pleasant, but it suggests that the queen is still laying, and they are just keeping the hive clean. We have not yet opened the hives. By looking around inside, we can get a better sense of the health of the hive: is the queen laying well? how much honey reserves do they have left? do they need supplementary honey to hold them over before spring flowers set? So it might be smart to check out what’s happening inside. However, by popping open the hive, we are breaking the laboriously installed propolis the bees have sealed their hive with. Bees do an incredible job maintaining temperature and humidity in the hive, to keep the queen and brood healthy. By opening the hive, we fuss with this. So we’re not going to fuss with this. (I’ll just bite my lip and hope they are keeping on ok). We did not harvest honey from the hives last year. Instead we opted to let them keep everything as reserves for winter – hopefully this will be enough to carry them through. If there’s anything left in the spring, we’ll collect some for ourselves. And lastly a fierce headwind from Pierre. Here are some examples (links) of what happens when legislative action is made without involving long term or whole systems thinking. South Dakota state legislature on net metering and on uranium mining. So we will continue to make phone calls. And write letters. We might even keep on with our wishful thinking and faith in democracy. But more importantly, we’ll sharpen our shovels. Ride our bicycles. And grow food for our neighbors. If we can’t demand conservation or good stewardship, maybe we can inspire it? This entry was posted in farm update and tagged honey bees, seeds, straw bale/cob by Cycle Farm. Bookmark the permalink. All the varieties of chickens look great. Maybe if the door to the coop had the bottom corners rounded the hens would see a giant egg and be inspired to lay more?